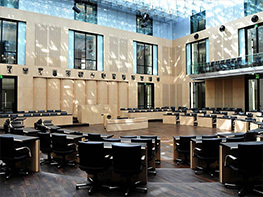 The plenary chamber in the Bundesrat. 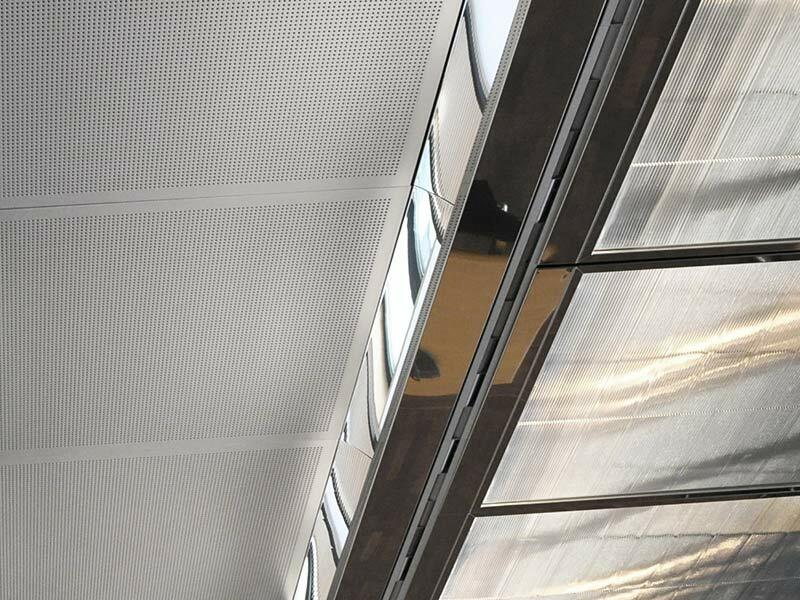 Supply air flows through slot diffusers into the committee chambers; exhaust air flows out above the panels. Schematic structure of needs-driven water treatment in combination with a low-pressure hybrid system with no increase in pressure. A Condair AT2 dynamic reverse-osmosis system provides mineral-free humidification water as needed; as a result, the hybrid humidifier has no need for a pressure booster pump at all. This combination was specifically developed by Condair to maximize energy savings. Inside view of a Condair DL hybrid humidifier. The image shows the hybrid humidifier’s control unit (above) and its central unit. The central unit contains the patented HygienePlus silver ionization unit and an additional sterile filter to ensure long-lasting hygienic quality. 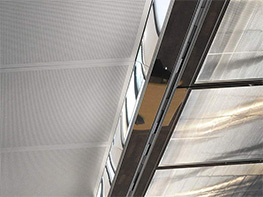 Seventeen years after the heating, ventilation and air conditioning units first went online at the Bundesrat (German federal parliament) building in Berlin, the first of the existing air washers that had been used for air humidification during that period were replaced with new, hygienic and energy-efficient hybrid air humidifiers as part of a multi-stage project plan. This project involved a whole series of challenges that had to be dealt with. In 1996, the Bundesrat decided to move its seat from Bonn to the federal capital of Berlin. Lawmakers’ choice for their new home was a prestigious former Prussian Manor on Leipziger Straße, built in 1904, which had been used by various different institutions since its construction. Renovations on this building, which is listed as a historic monument, started in 1997 under the leadership of the Hamburg architectural firm of Schweger & Partner, with investments of about € 200 million. In September of 2000, the Bundesrat then moved from Bonn to Berlin, where it has maintained its seat to this day. 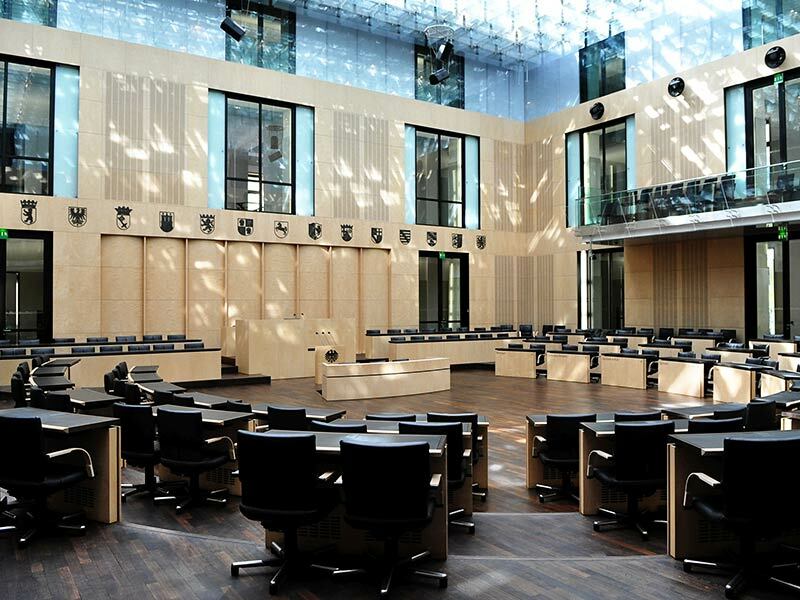 The project entitled “Modernizing heating, ventilation and air conditioning systems in the Bundesrat” started with two HVAC systems that supply conditioned air to the East and West committee chamber areas. Bundesrat committees meet regularly in these chambers. The two full central HVAC units, with heating, cooling, and humidification and dehumidification functions for processing outdoor air into conditioned supply air, have nominal air throughput ratings of 14,000 m³/h and 16,000 m³/h. Other HVAC systems in the Bundesrat building, including the ones for the plenary chamber, will be brought up to the latest technological standards over the next few months. 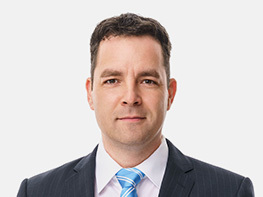 In early 2017, or about 17 years after the HVAC systems first started operating, the German Federal Office for Building and Regional Planning (Bundesamt für Bauwesen und Raumordnung, or BBR), which is responsible for all federal buildings in Germany and abroad, decided to replace two technically outdated, energy-inefficient high-pressure air washers in the Bundesrat building that had begun to develop certain problems with hygiene-related issues. In the meantime, the water used by the air washers for humidification had to be constantly supplemented with large quantities of biocides, in order to kill germs and bacteria and ensure the best possible hygienic conditions (considering the circumstances). The new humidification system aimed to eliminate this problem as well; the goal was to introduce a sustainable, energy-efficient, and hygienically superior solution. 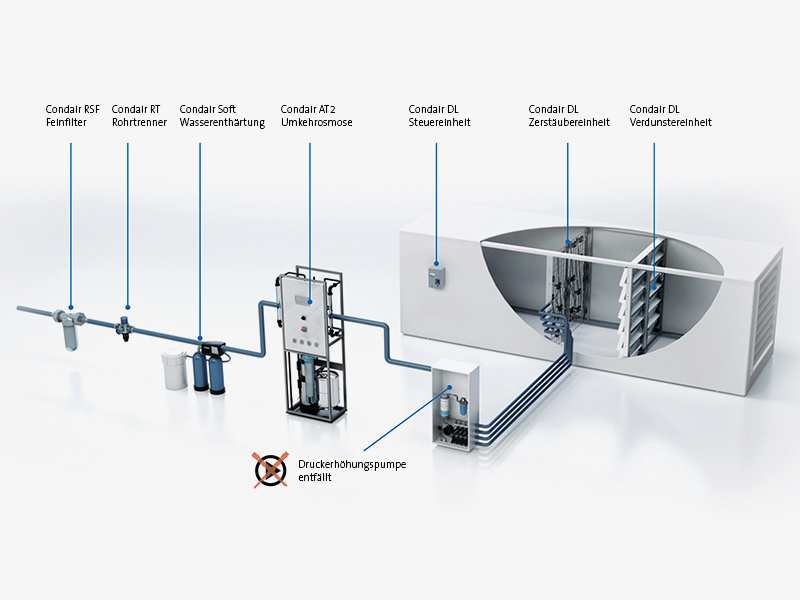 To that end, the BBR chose DL hybrid humidification technology from Condair GmbH, based in Garching. But besides the strictly technical requirements for the new air humidification system with regard to its humidification capacity, its precise regulation, and questions of energy efficiency and efficient processing of the humidifier supply water, another challenge in the upgrade project involved fitting the new humidification units exactly into the existing central HVAC units. 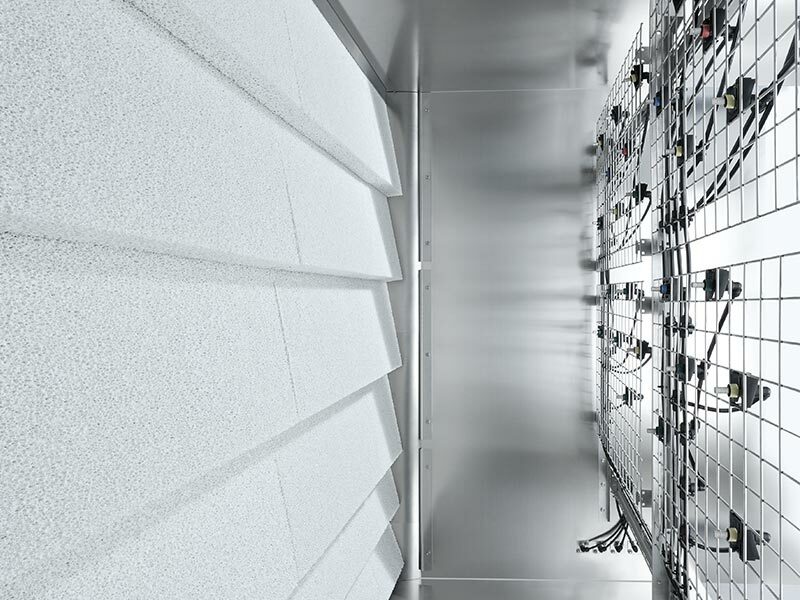 Condair technicians, working together with the HVAC manufacturers at Wolf Anlagen-Technik GmbH & Co. KG in Geisenfeld, completed this task brilliantly: The new technology, including the required housing components, was constructed to match the specified measurements down to the millimeter. The Condair DL’s short installation length of just 900 mm was especially helpful here. The two new hybrid humidifiers installed in the Bundesrat have nominal capacities of about 100 kg of water per hour, and pressure losses of just 50 Pa or so. 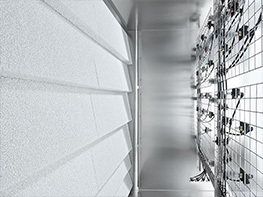 The HVAC units are set up to ensure a temperature of about 22–23°C (72–73°F) and a relative humidity of about 40% in the Bundesrat committee chambers to which they supply their air. A building automation system uses temperature and humidity sensors, and CO2 probes that record the current air quality, to control the operation of the HVAC units. The hybrid humidifiers work only in the cooler parts of the year, when the outdoor air is very cold and very dry. Under ideal operating conditions, when a stream of outdoor air at a temperature of -10°C (+14°F) is drawn in at 14,000 m³/h, then warmed and mixed with about 1 g/kg of moisture in the HVAC unit, the relative humidity of the air drops to values well under 5%. Such dry air would be completely unacceptable for hygienic purposes as supply air sent to occupied rooms, however, and would cause dry mucous membranes and eye irritation for the occupants. Therefore, the air must be brought up to about 45% humidity in the HVAC unit in order to ensure sufficient humidity in the rooms it supplies. Under the conditions mentioned above (-10°C / +14°F and moisture of 1 g/kg), the air must be heated to about 36°C (+97°F) in the HVAC unit’s heater, with a total heating power of about 215 kW, before it flows into the hybrid humidifier. This heating power is provided by heat recovery from exhaust air, and by district heating. Next, the heated air reaches the hybrid humidifier, where its humidity is raised from 1 g/kg to the target value of 7 g/kg (45% relative humidity). 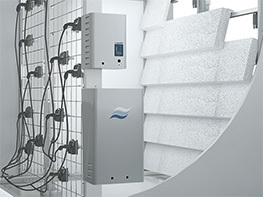 A humidification capacity of about 100 kg of water per hour is needed to achieve this (16,800 kg/h air mass flow x 6 g/kg = 101 kg of water per hour). For the two modernized HVAC units in the Bundesrat, no additional pump power is required for this atomization process. The hybrid system is able to do its job with just 35 W of total electrical power. 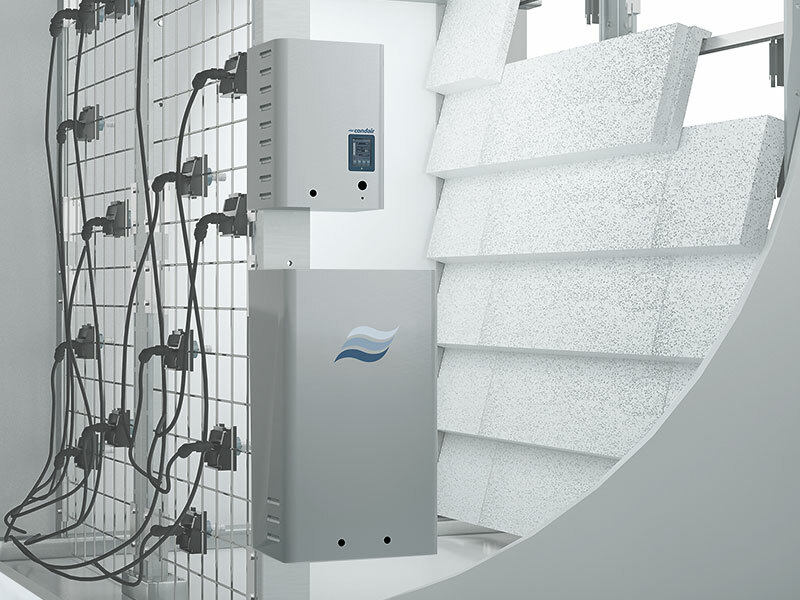 The Condair DL uses adiabatic humidification, lowering the air temperature to about 21°C or 70°F (cooling the air by 2.5 K per gram of water used to humidify the air), and the air must now be warmed back up to the target temperature before being sent along into occupied rooms. 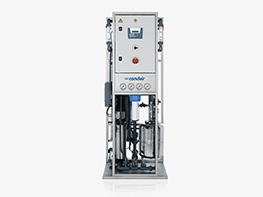 The water needed to operate the hybrid humidifier is treated in a water treatment unit consisting of a Condair Soft water softening unit and a Condair AT2 osmosis system. Condair DL hybrid humidifiers consist of an atomization unit with individually adjustable molecular atomization nozzles arranged on a support grid, followed by a patented ceramic-plate evaporation unit. To ensure hygienic operation, the previously treated osmosis water is then treated again with silver ions in the patented HygienePlus system. A part of the water sprayed out of the atomizer nozzles under low pressure evaporates directly into the air stream; the rest lands on the ceramic plates, which completely separate the humidifier water from the air stream and efficiently evaporate it. This hybrid process ensures the highest possible utilization of the water sprayed into the air stream, and also ensures hygienically humidified and aerosol-free supply air. 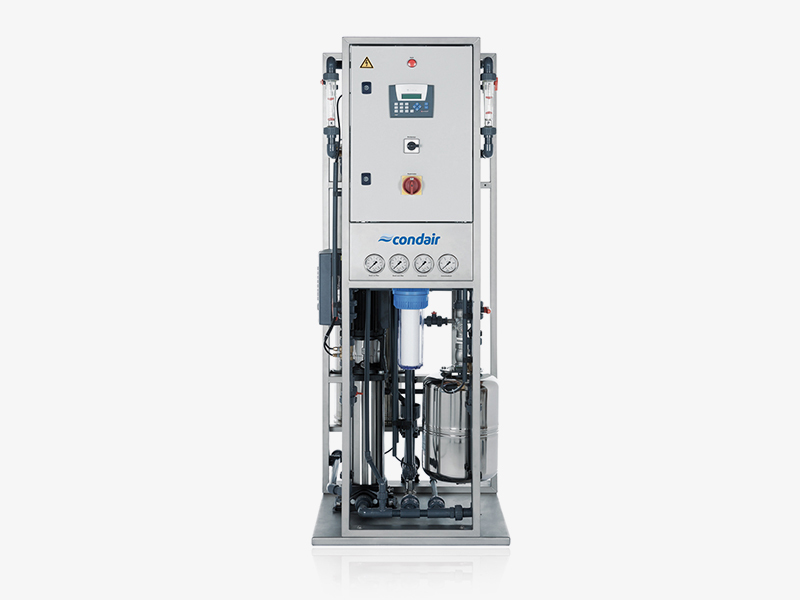 Other features of the Condair DL system are a short installation length of just 600 to 900 mm; small pressure losses; individualized control of each spray circuit; automatic, continuous control of humidification output based on current needs; and integration with an overarching control and automation system. The Condair DL series is available for humidification capacities up to 1,000 l/h and above. It received the DGUV test certificate from the BGETEM trade association for its optimal hygienic and equipment safety features. Dipl.-Ing. (FH) Jörg Martin, Condair Regional Center East, Berlin.